Consumers today are looking for new ways to make many of their household chores “green.” Organic soap nuts are becoming more and more popular these days as a laundry detergent alternative. In addition to being an organic soap option, they can also provide significant savings in laundry supplies. 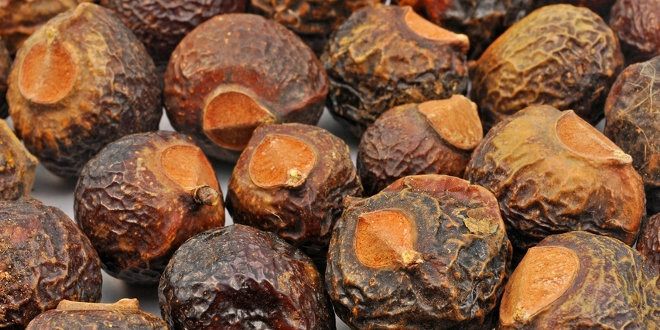 What are Organic Soap Nuts? At quick glance, this product looks a bit like the lychee and is sometimes referred to as a soap berry. However, unlike the lychee, this is not something you want to try to eat. The “berries” contain saponin, which is a natural soap as well as serving as a deterrent to insects, providing the tree with a natural defense against insects. The most common use of this organic product is as a laundry detergent substitute. For those of you who are looking for a “green” product, this can be one of the cheapest options available. 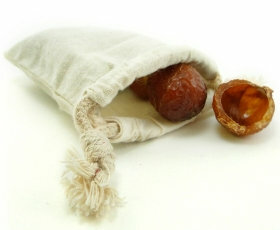 A single pound (450 grams) of organic soap nuts can clean 200 loads or more of laundry. To use them as an organic soap for your laundry, simply place about five nuts in a muslin bag and put the bag into the washing machine with the laundry. Your laundry will come out clean, fresh smelling and naturally soft. Whereas you only get one load of laundry from a cupful of detergent, you will get as many as three loads from a single batch of these nuts. When comparing the cost of a bottle of laundry detergent vs. the cost per pound of the organic soap nuts, you will see the significant savings in going “green” when doing laundry. Laundry is the most popular use, but it is far from the only thing soap nuts can be used for around the home. You can put a few nuts in a container, fill it with water, shake it, and you will have soap for washing your hair, doing dishes, or even cleaning your automobile. Instead of buying five or six different cleaning products and spending a small fortune on cleaning supplies, now all you need is nuts! Soap nuts can also be used in a convenient liquid form. This liquid solution contains concentrated saponin, which makes washing clothes with soap nuts even more efficient and cost-effective for households. Soap nuts liquid solutions are perfectly safe for all types of washing machines, including high efficiency and top loading washers. There are quite a few companies offering products made from soap nuts. Each company seems to be using their own cleaning and preparation methods, but for most part they all offer soap nuts in liquid or whole berry form. 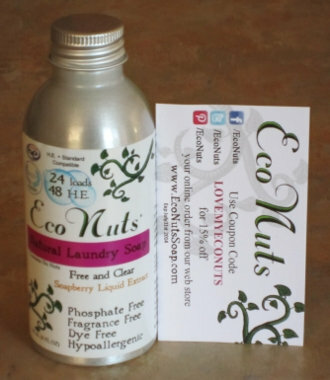 For our first experiment with soap nuts we chose to purchase the liquid washing machine detergent from Eco Nuts (www.EcoNutsSoap.com). We ordered “Eco Nuts Liquid Detergent 4 Oz”, the product recommended for high efficiency (HE) washing machines. It was listed as a highly concentrated soap nuts solution requiring only a teaspoon of liquid for one regular load of laundry. 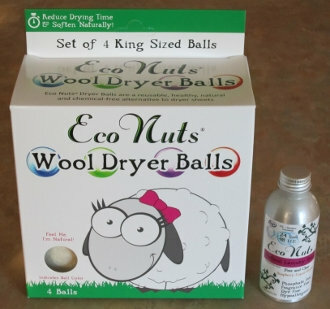 We also ended up purchasing a natural, healthy, reusable and chemical-free alternative to dryer sheets – the set of four “Plain Wool Dryer Balls”. After receiving the shipment from Eco Nuts and seeing the size of the liquid detergent container, one can't help but being a bit skeptical about the estimated number of laundry loads this tiny bottle can handle! Being used to buying large jugs of laundry detergent, it is easy to wonder how such a small bottle can contain enough “juice” to wash 24 to 48 loads of laundry! To give you an idea of the size, here is the photo of this small bottle right next to the a standard size business card. For the first wash, we used half a capful of the soap nuts detergent and followed the manufacturer's directions on the bottle and from the video. We were amazed at the outcome. Even though we did not use a fabric softener or any other scented chemical product, our clothes were clean, smelled fresh and incredibly soft. Products from Eco Nuts really lived up to our expectations! One thing is for sure, after this experience, we will never go back to the laundry detergents full of chemicals! Next Coffee Is Good For Me, Right?